I love to recycle bits and pieces from past journal pages to create new ones. It’s a great way to extend your art and by using your own artwork you end up with pages that are totally you. 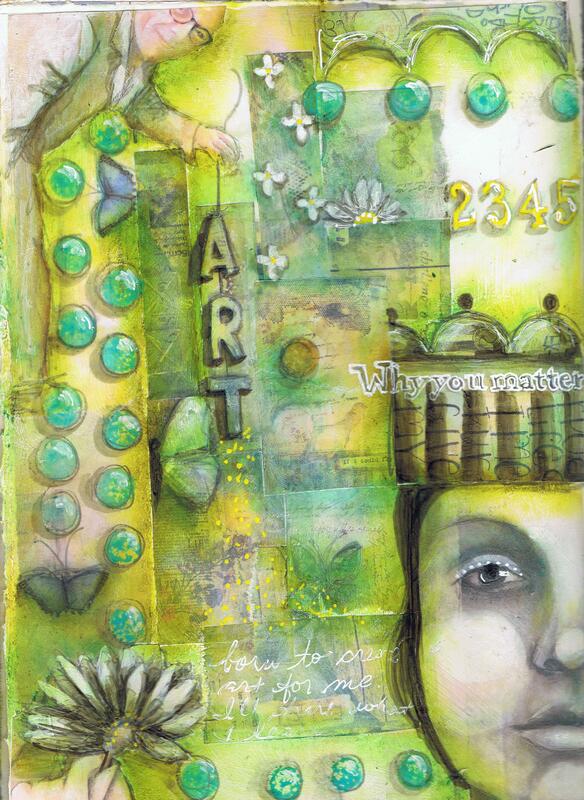 This is a sample page from my Journal 365 online workshop. It’s created on 9 x 12 watercolor paper in a hand-bound journal. Being creative everyday, whether completing a journal page or just adding a little more to an existing page, keeps you in a creative state of being. Be Creative! I agree with your statement about being creative everyday, and I love this, it’s beautiful Pam.. Your pages are always so interesting to look at because there is so much going on. On the surface, the images are pretty to look at, but I always end up getting absorbed in examining the details. There is so much depth I can easily spend 10 minutes or more just trying to decide how you achieved the effect. I love your articles in Art Journaling magazine. It’s great to get that extra insight into your process. Love the colours and the composition. There is so much to see, and it keeps me going back to look again. Just love your drawings.